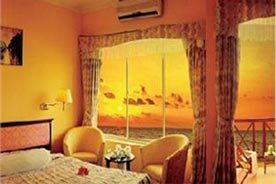 Hue is located in central Vietnam on the banks of Perfume River (Song Huong), just a few miles inland from the East Sea. It is about 700 kilometers (438 miles) south of the national capital of Hanoi and about 1100 kilometers (690 miles) north of Ho Chi Minh City. Hue people take their pride in a long-lasting history. The city has gone through 7 centuries of establishment and development. 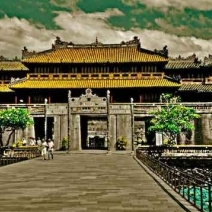 In 1802, Hue became Vietnam’s capital when Emperor Gia Long, the first King of the Nguyen emperors (Nguyen dynasty), chose the location for the imperial city. The city remained the nation’s capital until 1945, when Bao Dai, the last of the Nguyen emperors, abdicated and a communist government was established in Hanoi. In the Vietnam War, Hue’s central position placed it very near the border between North Vietnam and South Vietnam. Thanks to the long precious history, Hue has integrated material and spiritual values, which become its own unique special Culture. The city has 2 main seasons: dry season and rainy season. The former is fairly hot, lasting from March to August, while the latter begins from August, and is cool and wet. But the most special point is the short spring lasting from January till February, with a very cool and fresh atmosphere and green purity of new tree leaves here and there. This means if you would like to visit the city but still afraid of the hot or wet weather, please come in between January and February. Hue is one of the main cultural, religious and educational centers of Vietnam. So far, Hue remains to be the only originally historical vestiges city in Vietnam. Many of Hue’s attractions are found along the banks of the romantically named Perfume River with 11km length. This valuable construction includes more than 100 architectural works, which are the reflection of the life of Emperors and mandarins under Nguyen’s reign. Architecture in Hue is the combination of royal architect, folk, religious ones, traditional and modern sides. On December 11th, 1993, it was classified by UNESCO as the world cultural heritage. On the north bank of the river is the Imperial Citadel, built along the line of Peking’s Forbidden City, enclosed by 10-metre thick walls and surrounded by a moat. A few kilometers further up the river are perhaps Hue’s best-known religious site. Inside the citadel, there are still wonders. 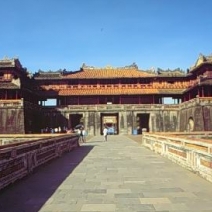 For example, the seat of the Nguyen emperors occupying a large, walled area on the north side of the river. Inside the citadel was a forbidden city where only the concubines, emperors, and those close enough to them were granted access, the punishment for trespassing was death penalty. If you like something mysterious and valuably architectural, you should take a visit to the tombs of ancient Kings. Situated in the middle of the hills on the Southern bank of Perfume River are very beautiful tombs of Nguyen Kings. Among these tombs are the four famous ones with the name and the arrangements of the tomb reflecting each Emperor’s points of view, personality, and tastes. This is majestic Gia Long tomb, imposing Minh Mang tomb, poetic Tu Duc tomb and magnificent Khai Dinh tomb. No architects who would like to discover ancient architecture of Vietnam could ignore Hue’s old citadel vestiges. A lot of foreign tourists are curious about Hue’s ritual royal music. Originated from 8 kinds of ritual music under Le dynasty, under Nguyen dynasty, it has improved into 2 kinds of music: "Dai nhac" and "Nha nhac" which are really magnificent, and skillful. Those are only played on formal occasions. This city is proud to be the cradle of traditional music. The Royal Refined Music was proclaimed by UNESCO as a Masterpiece of the Oral and Intangible Heritage of Humanity on December 1993. Hue is also an important center of Buddhism. In Hue and the surroundings still exists tens of pagodas constructed more than 300 years ago, and a hundred of temples and pagodas built in the early century. Thien Mu Pagoda, with its distinctive seven-storey octagonal tower. Besides all these, Hue’s culture is also found in its famous "non la" or conical hats. You can buy these at the enormous Dong Ba Market as a remarkable and graceful piece of souvenir of Vietnam. A foreign friend of mine had a chance to meet a long-haired Hue’s Vietnamese girl in the traditional violet long dress and a graceful conical hat. And can you guess what happened? He fell in love with her at first sight, and they are now a very happy couple – husband and wife!! Vietnamese cultural grace could win any heart! The cuisines of Hue are rich, but one of the most striking differences is the prominence of vegetarianism in the city. Several all-vegetarian restaurants are scattered in various corners of the city to serve the locals who have a strong tradition of eating vegetarian twice a month, as part of their Buddhist beliefs. No one who has come to Hue could ignore its ancient beauty and romance. Taking a cruise along the Perfume River, having some special cuisine, and listening to Nha Nhac Royal Music, you can feel the actual picturesque view of this natural classical mysterious city!